It’s a traditional Greek salad made with orzo and a greek vinaigrette! You know one of the things I hate about getting older? Hurting yourself by doing seemingly nothing at all. Like, you cough and throw your back out. Or you wear high heels for a few hours and damage your arch. Or you get a good nights sleep and wake up with a bruised hip. How do you hurt yourself in your sleep? Seriously. Last weekend, when Jordan and I were staying at The Beverly Hilton, I slept really hard for several hours on my right side. When I woke up during the night my hip hurt but I turned over and tried to get comfortable and go back to sleep. The next morning it still hurt. It hurt to walk, to bend, to stretch, to lay down. It hurt for 3 days! Yes, my friends, I’ve reached the age where I can hurt myself while sleeping. So now I have to avoid carbs, eat more salad, and….stretch before sleeping? Or something? Luckily, I have the “more salad” thing covered. This easy Greek Pasta Salad was so refreshing and easy to make. Greek salad is one of my favorites and by adding some pasta it became a simple dinner (and lunch the next two days). I love a good Greek salad. It’s always my go-to order at Panera, because I love their Greek vinaigrette so much. This Greek dressing is almost a Panera copycat recipe. 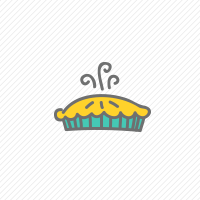 It’s full of flavor and has that same taste. The dressing makes the salad and this one satisfies. 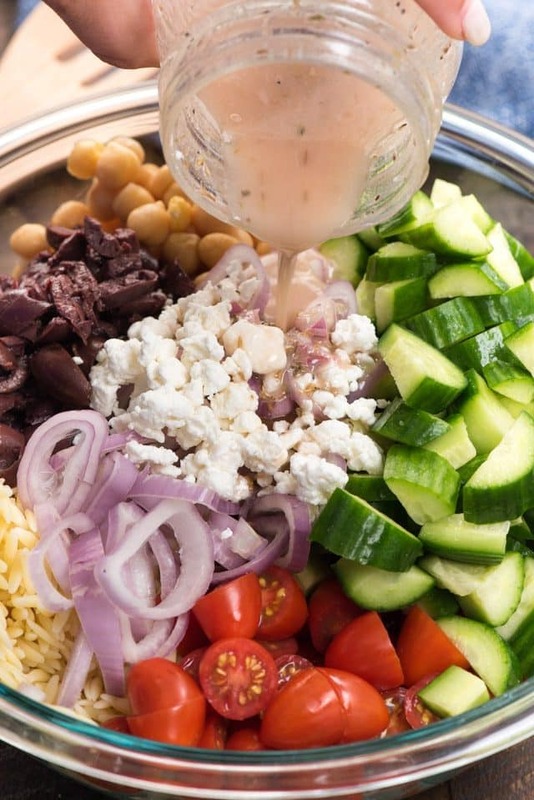 How do you make the best ever Greek salad dressing? This one has a secret ingredient! Feta cheese. That’s right! I added a bit of feta cheese to the dressing. When you shake it up it mixes in and becomes a bit creamy without being too over-the-top. I’m not a fan of creamy dressings, so the light extra flavor the feta lends this vinaigrette is perfect. The dressing is also amped up with red wine vinegar, lemon juice, garlic, and oregano. 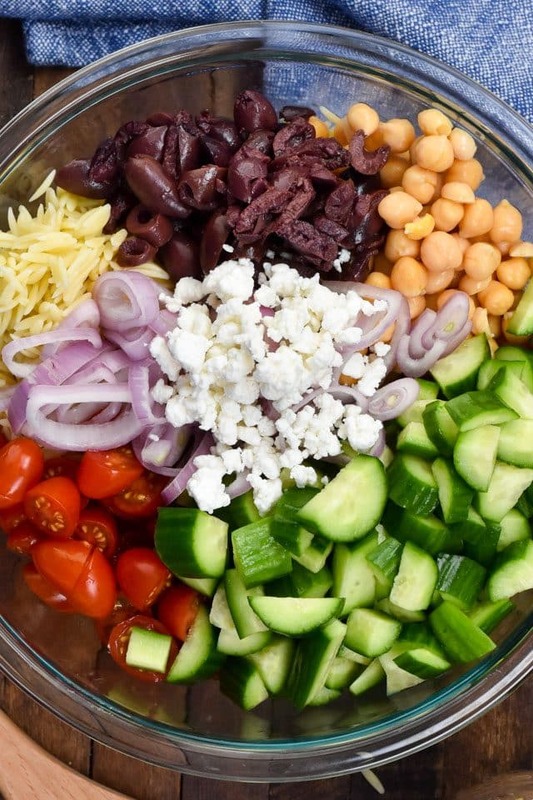 All are an important part of any Greek salad flavor profile. Greek pasta salad can have so many different ingredients in it, but I went with traditional and easy favorites. This is a pasta salad, so you need pasta, obviously. One of my favorite pastas of all time is Orzo. In my mind it’s an under appreciated pasta. Orzo is a small pasta that looks like rice but it’s all pasta. It’s hearty and perfect for pasta salad or hot past dishes, but can stand up to soups and stews also. I love putting it in chicken noodle soup as well. Even though orzo is pasta, I feel like it’s kind of a cheater pasta because it’s not huge. Adding a bunch of fusilli or shells or elbows to a salad can make it a carb buster, but I find the orzo adds that pasta flavor without being overwhelming. All combined these flavors and textures create the perfect crunch. This would be a great salad for a party or any night when you want to have leftovers for lunch the next day. 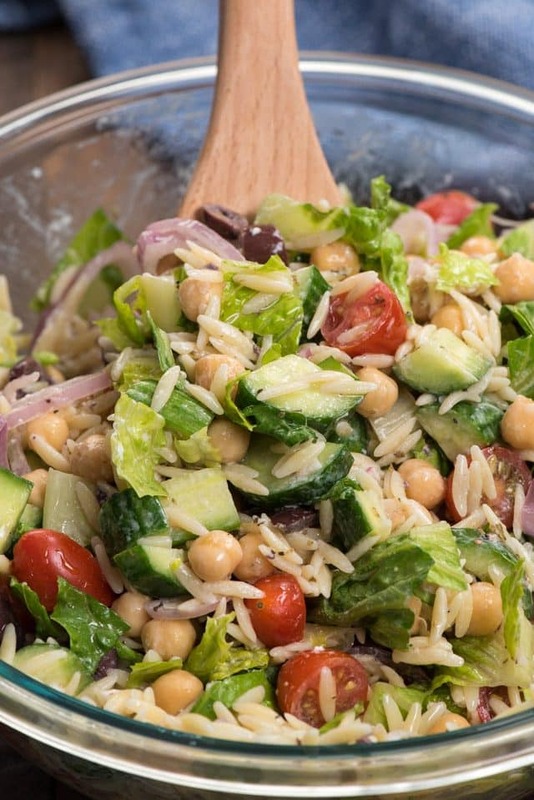 Greek pasta salad is a fresh salad with orzo pasta, tomatoes, cucumber, olives, feta, beans, and a homemade Greek vinaigrette. If you’re looking for an easy Greek Pasta salad this is the one you need to make! This easy Greek Pasta Salad is the perfect side dish or potluck recipe! We love the easy homemade Greek dressing too! 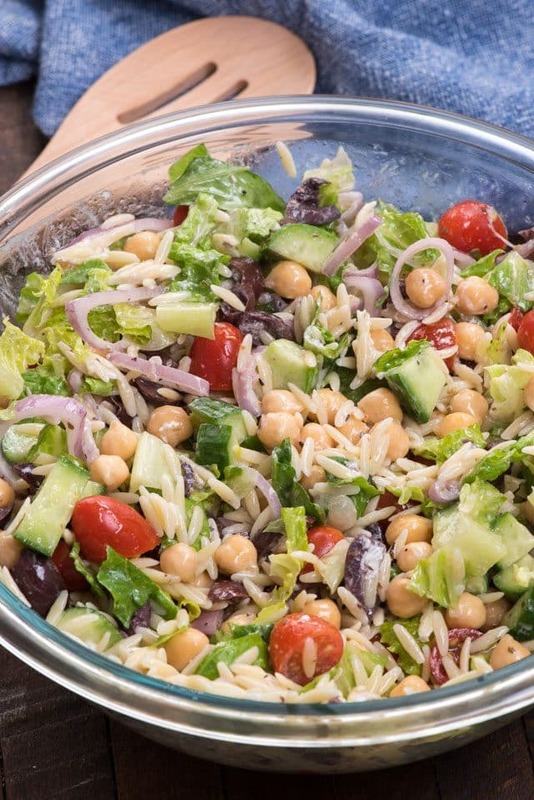 Place lettuce, orzo, tomatoes, onion, olives, beans, and feta in a large salad bowl. Make the dressing: add all dressing ingredients to a jar. Cover and shake to combine. Store in refrigerator up to 12 hours before serving. Store in an airtight container for up to one day. Check out Holly’s BLT Pasta Salad, Mary’s Spinach Pasta Salad or Lisa’s Shrimp Pasta Salad for more pasta ideas! 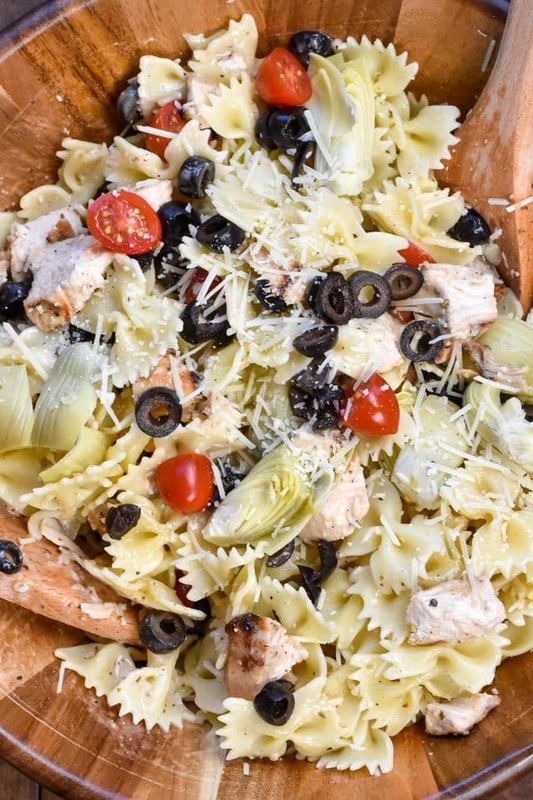 Mediterranean Chicken Pasta Salad is another summer favorite! 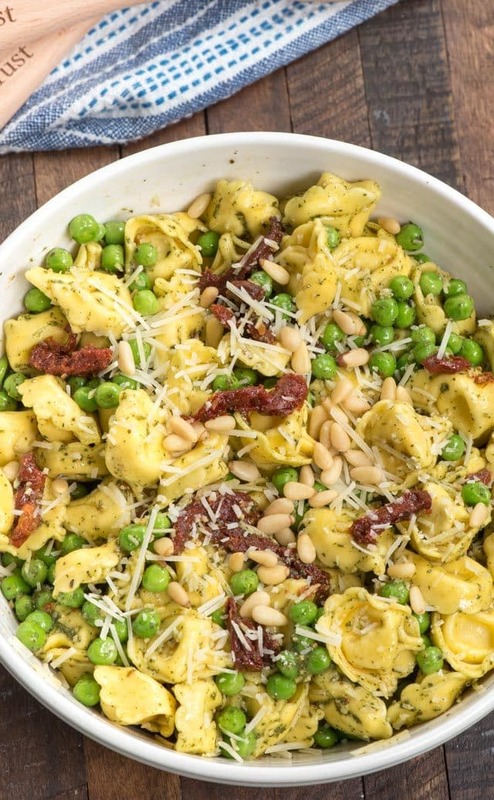 If you love tortellini, this Pesto Tortellini Salad is for you! Craving BBQ chicken? 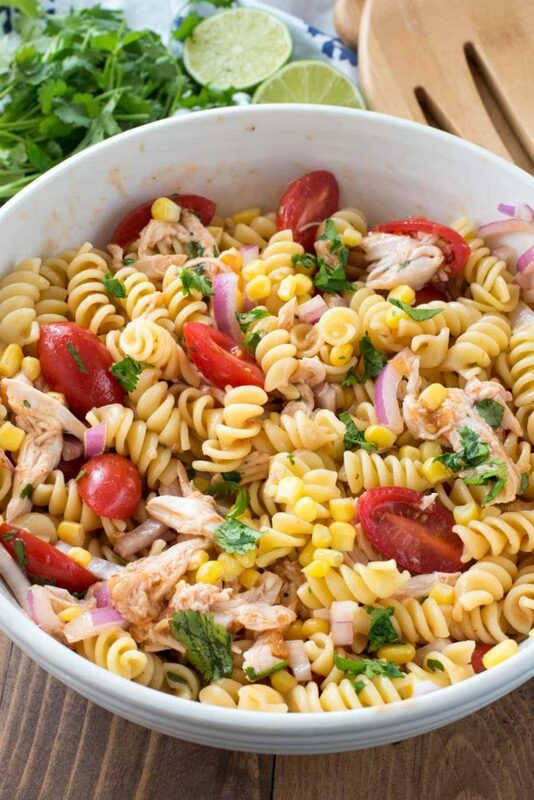 Make a BBQ chicken pasta salad! Anytime I can save money at Panera I am down with that! I went there yesterday and a salad and a drive ran me 16.00 for 1 person. Where is the actual recipe. You’ve listed the ingredients and that’s fine for the tomatoes, cucumbers, etc., but how much of the dressing ingredients do you use?